The IRB 2600 is the second model in the sharp generation range with enhanced and new capabilities. It is a compact robot with a high payload capacity. The design has been optimized for targeted applications like arc welding, material handling and machine tending. 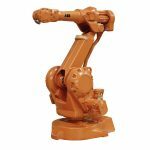 The IRB 2600 is available in three variants, with options for floor, wall, shelf, tilted or inverted mounting c1onfigurations.